Many Germans believed in their nation standing up "in a manly way" for its place in a competitive, dog-eat-dog world. And some Germans favored policy that would appeal to the patriotism of common Germans, a patriotism they hoped would help diminish the growing political power of the labor movement, represented in parliament by the Social Democrats. In the spring of 1911 came another crisis over Morocco, beginning when rebels there besieged the sultan, Mulay Hafid, at his palace at Fez. The sultan appealed to the French to rescue him. The Germans feared that if French troops went to Fez they would stay. The German government protested, but France sent troops to Fez anyway – and Spain sent troops to occupy that part of Morocco that France had promised in secret agreements in 1904. The Germans claimed that France's move violated the settlement they had agreed to back in April 1906. Germany's hawkish press expressed exasperation with France and demanded that Germany's position in Morocco be maintained and respected, and these demands were widely supported by the German public. Von Moltke (the younger). He feared German weakness. In Germany, mere words were seen as weakness. The German government demonstrated its resolve by sending a warship "The Panther" to the port of Agadir, on Morocco's Atlantic coast. Germany's show of force was an embarrassment to France's prime minister, Joseph Caillaux, a wealthy financier who wanted peace and reconciliation with Germany. In November 1911, four months after the Panther arrived at Agadir, Germany and France negotiated a settlement. Germany agreed to France establishing a protectorate over Morocco, and Germany received a little strip of land from the French Congo, giving Germany's colony, Kamerun (Cameroon) access to the Congo River. This agreement outraged Germany's hawks. In parliament they accused the German chancellor, Bethmann-Hollweg, and Germany's secretary of state, von Kiderlen, of "unforgivable" timidity. 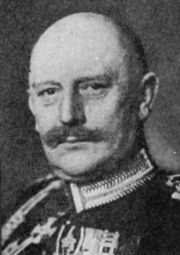 Chief of the German General Staff, Helmuth von Moltke (the younger), saw his country as having crawled away from the negotiations with its tail between its legs. French politicians opposed to Caillaux's tax reforms used Germany's belligerence to win opposition to his government. Anti-German torchlight parades erupted, and on 11 January 1912 Caillaux's government fell. Caillaux was replaced by Raymond Poincaré, who rode the wave of an enhanced patriotism, confidence and pride. A new policy toward Germany was launched. Poincaré announced that the French did not want war but neither did they fear it. He said also that the first duty of a good citizen was to be "a courageous and disciplined soldier." He denounced "internationalists" and pacifists and spoke of the province that France had lost to Germany in the war of 1870-71, Lorraine, the place of his birth, as "a bulwark" for France. Germany's standing up "in a manly way" against the French concerning Morocco not only stirred up French belligerence, it disturbed the British. The desire for a rapprochement with Germany that had been developing in Britain quickly evaporated. British strategists were frightened into believing that they should stand firmly by their alliances with France and Russia. Britain signed an agreement with France that allowed a more efficient use of both their navies. The agreement held that should war break out, Britain was to defend the waters between it and France and the waters along France's Atlantic Coast, while France's navy was to act in behalf of both nations in the Mediterranean Sea.